Product prices and availability are accurate as of 2019-04-13 01:55:40 EDT and are subject to change. Any price and availability information displayed on http://www.amazon.com/ at the time of purchase will apply to the purchase of this product. 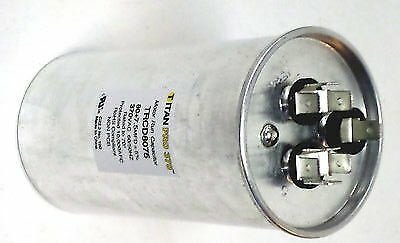 TitanPro TRCD8075 HVAC Round Dual Motor Run Capacitor. 80/7.5 MFD/UF 370 Volts Dimensions: Diameter- 2.64 Height- 4.33 Add 1/2 inch to height for terminal length. Round in shape. There are 1/4" male terminals on the capacitor. Rated at 80/7.5 MFD/uf 370 Volts 50/60HZ. Features: Heat tolerant, tested up to 60,000 hours of run time. Cans are made of high-grade metallized polypropylene film and proprietary Epoxidized Soybean Oil (ESO). Three tri-blade terminals (c, h, f) Rated to 158 Degrees (Fahrenheit), Protected to 10,000 AFC. Meets UL 810 safety standards.